From a citizen perspective, there are three main questions in climate change science: What happened? Who done it? How bad is it going to get? Those questions roughly correspond to the scientific issues of detection, attribution, and climate sensitivity. Today’s post offers an historical perspective on Christy’s critique of the consensus position. In his comment letter, Christy magnifies and analyzes a section of a chart (Figure 10.SM.1) “buried . . . without comment” in Supplementary Material for the IPCC Fifth Assessment Report chapter on climate change detection and attribution. 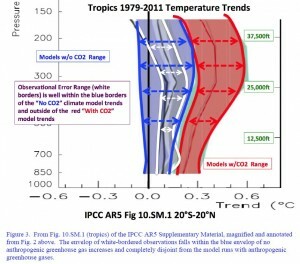 This IPCC figure shows that the white-bordered observational envelope lies completely within the blue envelope of models which have no extra greenhouse gas forcing. Thus, the proper scientific conclusion here is that the models demonstrate that CO2 has had no discernable impact in the atmospheric region where models assert greenhouse gas impacts should be largest. In other words, natural variability accounts for all warming of the bulk tropical atmosphere since the start of the satellite record (the past 34 years). Remarkably, the IPCC’s analysis implies that Nature done it! Christy’s finding clashes with the IPCC’s official story arc of ever-greater scientific certainty. 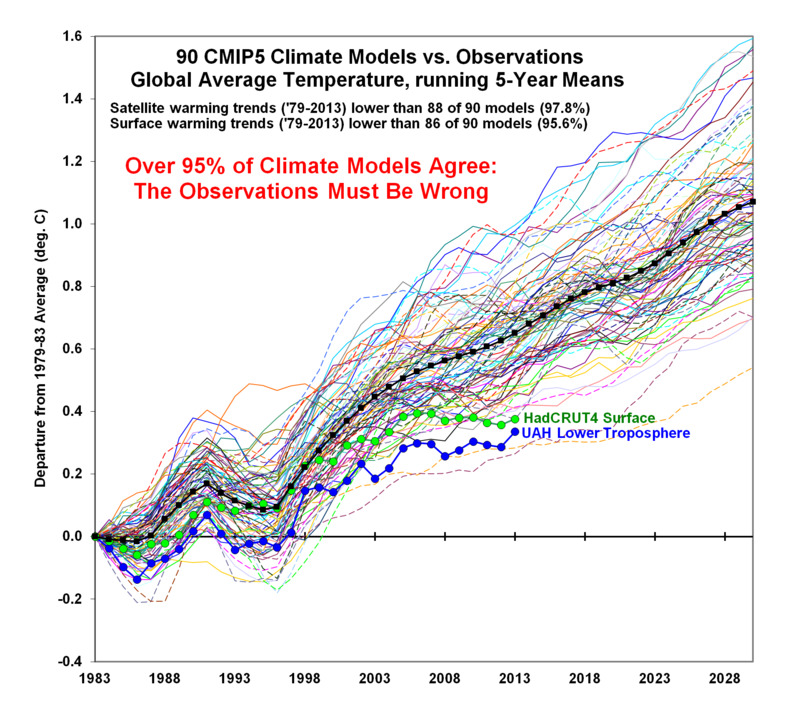 Let’s review the IPCC’s climate change attribution assessments from 1990 to the present. Bear in mind that, in IPCC parlance, “likely” means a probability greater than 66%; “very likely,” greater than 90%; and “extremely likely,” greater than 95%. The size of the warming is broadly consistent with predictions of climate models, but it is also of the same magnitude as natural variability. Thus the observed increase could be largely due to this natural variability; alternatively this variability and other human factors could have offset a still larger human-induced greenhouse warming. The unequivocal detection of the enhanced greenhouse effect is not likely for a decade or more. The balance of evidence, from changes in global mean surface air temperature and from changes in geographical, seasonal and vertical patterns of atmospheric temperature, suggests a discernible human influence on global climate. Our ability to quantify the human influence on global climate is currently limited because the expected signal is still emerging from the noise of natural variability, and because there are uncertainties in key factors. There is new and stronger evidence that most of the warming observed over the last 50 years is attributable to human activities. . . . In the light of new evidence and taking into account the remaining uncertainties, most of the observed warming over the last 50 years is likely to have been due to the increase in greenhouse gas concentrations. However, if Christy’s analysis is valid, climate change attribution may be less certain now than it was in 1990. In the FAR, the IPCC said observed warming was “broadly consistent” with climate model predictions although of the same magnitude as natural variability. In the AR5 information unpacked by Christy, observed warming remains of the same magnitude as natural variability but is inconsistent with model predictions. I realize that IPCC attribution statements refer to a period longer than the satellite record, and are based on analyses of several components of the climate system, not just temperature change in the tropical troposphere (AR5, Ch. 10). 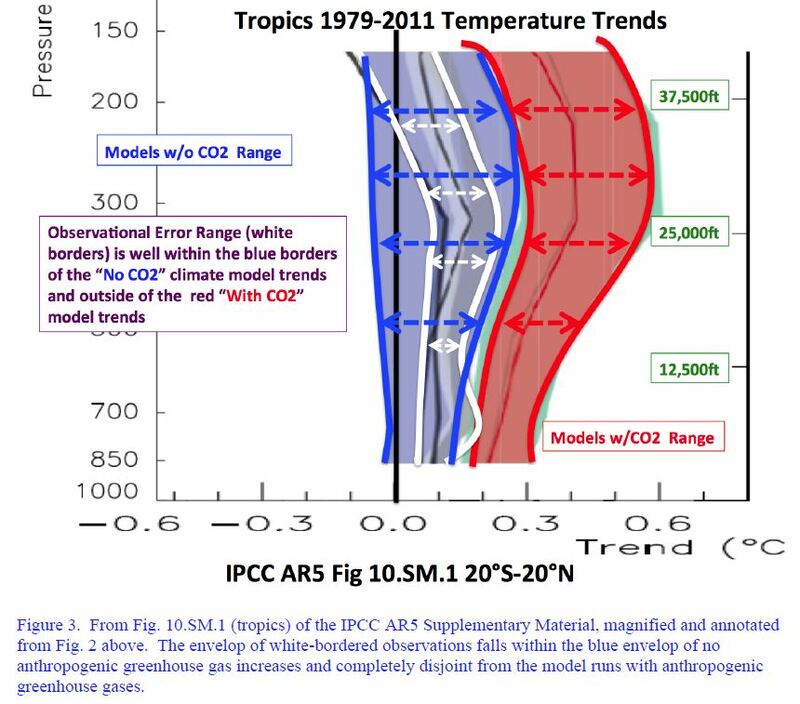 Nonetheless, as Christy points out, the tropical troposphere is the portion of the atmosphere where models project a “highly consistent and significant” warming response to rising CO2 concentrations. If the models do not show a discernible human influence in the tropical troposphere, how can they show that more than half the warming is anthropogenic for the planet as a whole? Christy’s critique of the core “consensus” position is serious and substantial. Suppose IPCC-affiliated scientists cannot refute it. 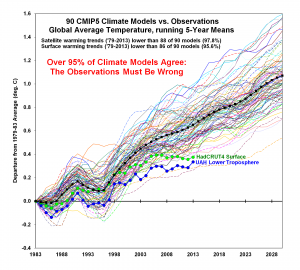 How uncertain does the claim that most recent warming is anthropogenic become? Should “extremely likely” be demoted to “very likely” or just “likely”? Are we back to a debate about what the “balance of evidence” “suggests”? Or would an honest broker say that “unequivocal detection of the enhanced greenhouse effect is not likely for a decade or more”? By law, agencies are required to respond to every unique and salient comment they receive on their regulatory proposals. Alas, it is more than “extremely likely” that no amount or quality of scientific criticism will dissuade EPA from promulgating the Clean Power Plan. The IPCC acknowledged “… that the long-term prediction of future climate states is not possible”. So why are global warming alarmists constantly pumping out into the public domain, more and more outrageous alarmist claims relating to climate, with so much certainty over their claims?